I can't quite recall how I first encountered Emily Craven. I've never met her but, while I was starting to wrestle with this whole brave new world of ebooks, suddenly there she was. The prolific tweets and Facebook updates of both Emily and author Joanna Penn were filled with good advice, told in an amusing way. Both of them carry a "can do" attitude that moved me from wondering whether I could possibly ever do such a thing through "well, why not" to having now done it - created ebooks, covers, and so on. I haven't taken the next step yet that both of those have - selling on Amazon, Smashwords and so on - but I'm on my way. Emily is an enthusiast, a cheerleader for the cause of ebooks and an inspiration to others to follow her path. 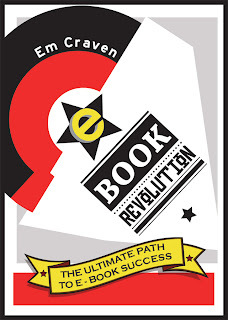 And E-Book Revolution is her road map, created to help others along the way. The book is filled with good advice - it could perhaps use a little tweaking in its format, but the useful information makes the book burst at its virtual seams. From QR codes to why giveaways are important, from building your audience to hopeful financial success, this is a treasure trove for writers. The criticism about format I should make clearer - there are links galore in the book to take you off to various corners of the internet that themselves are great resources. This is great if you're on a device that lets you zip there at a click of a button, but if you have a device that doesn't make this easy or just want to keep reading and come back to those resources later, a compilation of links at the end of each chapter would be great. That said, don't take that as too much of a criticism, for the information in this book is going to keep you coming back for more. She addresses issues with traditional publishing, how royalties work in the ebook world against the printed world, marketing, important sites to sell your work through and how to do so, making sure you use a good editor and proofreader so that readers don't falter when they encounter a typo that snuck through, and more. The early review copy I had of the book had a couple of those typos and I could hear the grrr in Emily's Facebook response when I let her know about them, which shows how much she cares about getting it right - and the importance of making sure the proofreader you rely on really does have that eagle eye they promised. The parts I found most invaluable were links to such things as Pay With A Tweet - rather than an outright giveaway of the book, ask people to pay for it by a simple tweet, helping to spread the word about your book. She also inspired the current audio recordings of my novel that you can find here on my site - it seemed a simple idea to introduce people to your work for free. Free is always painless - my embarrassment at my own voice aside, in this instance! There's advice about Google keywords, strong urging to get out there and blog, write, make yourself known, and recommendations to find forums for readers of work in the same field as yours, be it fiction or non-fiction. Emily's a witty writer, making this anything but a dry textbook. It's already done the trick with me to kickstart ideas for how to promote my own ebooks, and for that alone I thank her! To begin to tell you about the book doesn't even begin to cover it - every page has a new idea. This comes highly recommended. It is also available on other platforms.